The days are flying by along with the fish — yes, in these brilliant blue waters, much warmer than in the south, there is actually very little life. One of the few fish in these waters are flying fish. They’re small, only getting to a length of about 6 inches, so they are frequently eaten. There defense is to literally fly out of the water, spreading their wings (yes, they have wings) and using their stiff tails as rudders, they skip along the water in a zigzag for up to fifty feet. On Friday, we spent the day in St. Helena, an island probably most famous for being the final place of Napoleon’s (Groiny Boney) exile. 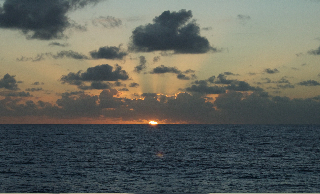 Since we’re in the tropics and closing in on the equator soon, the temperatures are much warmer, even the air conditioning on the ship has struggled with the high humidity. (At this point, I’m never sure if it’s really hot or if I’m just having a constant hot flash.) Hundreds of miles from any other inhabited islands and over a thousand miles from Africa, St. Helena’s population (the Saints) long for an airport, tourists, more jobs — sounds like Idyllwild doesn’t it? It’s fascinating visiting these islands and talking to the locals — St. Helena is so different from Tristan, and sadly doesn’t have the wealth of fish like the Falklands. 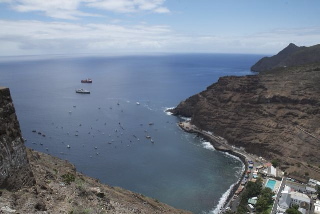 In the 17th century, when sailing ships were going around to India and China from Europe, St. Helena was an important stopover for resupplying in the tropics (there’s not much wind so ships would really slow down). The population has declined steadily since but Saints are still very friendly and we were giving a royal welcome. Our next stop will be Ascension Island and we have a packed day planned. They predict the weather to be hot and dry and since these will be the first sandy beaches (with warm weather) on this trip, several are planning on spending the afternoon at the beach. We’re going back to the beach after dinner in hopes to see Green Sea Turtles laying eggs. These turtles make an amazing migration from the coast of Brazil to Ascension Island to lay their eggs — a four-month journey covering about 1,500 miles with nothing to eat — then they go back and spend the next several years off the coast of Brazil before doing it all over again. If we’re really lucky we’ll get to see baby turtles erupt from the sand and make their way into the ocean to start their first trip to Brazil. Scientists don’t really understand the behavior — all they know is there is nothing to eat in these waters and the opposite is the case for coastal Brazil — it happens to be one of the few places in the world where the sea is incredibly rich — much like off the coast of California (50% of the world’s fish live in .1% of the ocean). Oh yeah, we sit through hours of lectures every day hoping to retain a little. This entry was posted on Thursday, August 26th, 2010 at 6:57 am	and posted in Uncategorized. You can follow any responses to this entry through the RSS 2.0 feed.